Spirit Mountain Casino is Oregon’s #1 gaming destination located in Grand Ronde, Oregon. Beyond their casino floor—which includes over 1,500 different slot machines—there is a luxury lodge for weekend getaways, seven different dining options, as well as regularly scheduled world class entertainment. Located only an hour and a half outside of Portland and thirty minutes from the Oregon Coast, this is a prime location for people who want a weekend getaway. 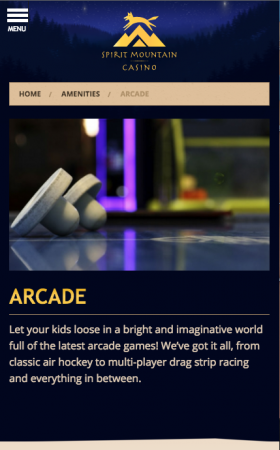 Adpearance has been working with Spirit Mountain Casino for over six years, and in that time their strategy has evolved from standard digital marketing into a robust plan that spans across multiple platforms and truly engages with their audience. Through social media and paid advertising, our our integrated campaigns tie offline marketing to online strategy. Not only have we increased active users to the Spirit Mountain website, but we've grown an online community of engaged fans. 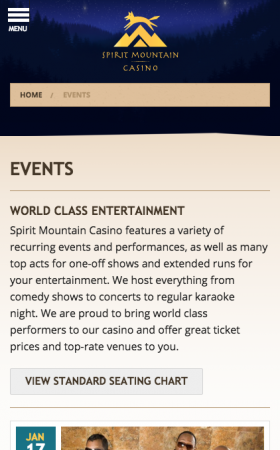 As technology and search functions begin to mature, it is our goal to continue assisting Spirit Mountain Casino in both digital advertising and the overall web presence to deliver their customers the best experience available. Since starting social media management, Adpearance has helped Spirit Mountain garner a following on Facebook of over 71,000 fans, which has surpassed the major casinos within a 250 mile radius. Our social media goal is to provide a consistent update of information to users regarding current events at the casino to help drive ticket sales, as well as share any local news so people are well informed of what to expect when they arrive for their next visit. Our work on Spirit Mountain's Songbook Series campaigned earned us the Best Digital Strategy award from the Portland chapter of the AMA in 2014. Ticket sales and room bookings are a primary focus for paid advertising, and the campaigns that our direct team has created help to drive traffic to the website and increase conversion rates. 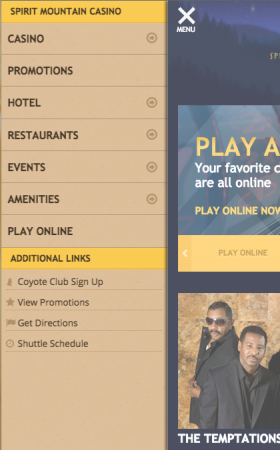 In 2015, on average, 16.5% of traffic on the Spirit Mountain Casino website was via paid search users. Our digital advertising efforts across multiple platforms—Google AdWords, YouTube, Bing Ads, and Facebook—have yielded positive results for Spirit Mountain Casino, driving leads for lodging and casino events. 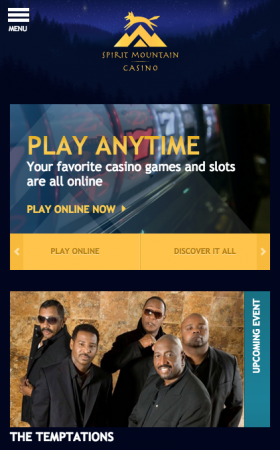 In 2010, we redesigned Spirit Mountain Casino's website with a separate mobile version. In early 2016, we will be launching a new responsive website that maintains the overall look and feel for continuity with users, but with subtle modernization and design updates for improved user experience. Like what we did for Spirit Mountain Casino?